Minnesota Vikings stadium debate:	“No tax money for a rich man’s stadium” | Fight Back! St. Paul, MN - Chanting "Money for human needs, not for stadiums," members of the Welfare Rights Committee, the Minnesota Coalition for a Peoples' Bailout and supporters from OccupyMN gathered outside Senate Taxes and Local Government and Elections committee hearing, Nov. 29, at the State Capitol building. The committee was holding an informational hearing on proposals to build a new stadium complex for the Minnesota Vikings football team owner - a New Jersey real estate developer named Zygi Wilf. Protesters carried signs reading "Kids can't eat footballs", "No tax dollars for stadiums" and "We need housing, not stadiums." 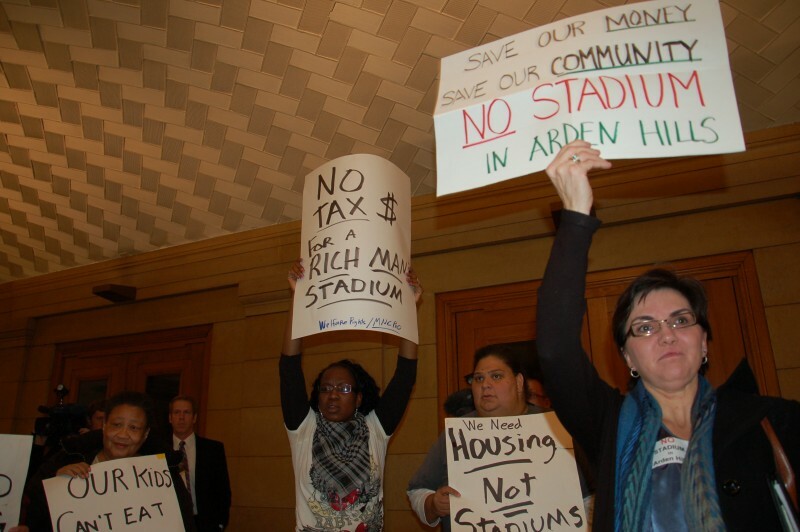 Welfare Rights Committee member Darnella Wade stated, "They [the Minnesota legislature] cut my wages for being a personal care attendant and now they want to use our tax dollars to build a new stadium? That's a crying shame." People are mobilizing for the next hearing, on financing proposals for the stadium, scheduled for Dec. 6.